LG GSA-H10N Super Multi DVD drive is a Dual Layer DVD+/-RW plus DVD-RAM writer and burner. The LG DVD burner supports DVD discs for DVD+RW at 16X8X16, DVD-RW at 16X6X16, Dual Layer at 10X/6X and DVD-RAM at 12X, with buffer memory of 2MB. 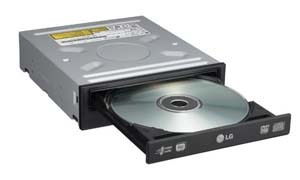 LG GSA-H10N also backward compatibility with all CD, CDR and CD-RW discs. ComputerAct!ve reviewed LG GSA-H10N DVD burner and gave the DVD writer the rating of 4 out of 5 and concluded that don’t be put off by the need for an internal installation – the LG GSA-H10N is a cheap and easy way of adding multi-format disc reading and writing to your PC.